Rodgers and Hart formed one of America’s first great musical theater songwriting partnerships. This legendary team consisted of the composer Richard Rodgers (1902-1979) and the lyricist Lorenz Hart (1895-1943). They composed together on Broadway and in Hollywood for 39 musical productions, producing more song standards than any composers of the day, all of which are still performed. They wrote what is considered New York City's first them song, the 1925 song "Manhattan". Richard Rodgers is one of only two people in history to have won all five major awards: an Oscar, Grammy, Emmy, Tony, and Pulitzer Prize (the other is Marvin Hamlisch). Rodgers had three significant periods in his incredible 60 years of composing: the Rodgers and Hart period (1921-1942), the Rodgers and Hammerstein period (1943-1959), and the Rodgers Independent period (1960-1979). As a creator of popular melodies, he ranks high above any other composer of musicals, having created over twice as many song standards many of which are routinely played today. Richard Rodgers was formally trained and attended Columbia University and the Institute of Musical Art (now the Juilliard School). His musical composition "shows the highest degree of consistent excellence, inventiveness, and sophistication", and his waltzes are given an ultimate compliment, being known simply as "Richard Rodgers Waltzes". In addition to his song standards, he composed the highly acclaimed symphonic pieces "Victory at Sea" and "Slaughter on Tenth Avenue". In 1978 the Richard Rodgers Award was created for the development of musical theater. In 1990 the 46th Street Theater was renamed The Richard Rodgers Theater. Lorenz Hart was born in New York and attended Columbia University School of Journalism. By 1918, Hart was working for the Shubert brothers, partners in theatre, translating German plays into English. He starting collaborating with Richard Rodgers in 1919 and remained with him until Hart's untimely death in 1943. Quoting from reviews, "Lorenz Hart's lyrics, facile, vernacular, dazzling, sometimes playful, sometimes melancholic, raised the standard for Broadway songwriting. They showed greater sophistication in subject matter, more use of overt verbal cleverness, and more of a New York or Broadway sensibility than any other lyricist of the day." Rodgers and Hart met in 1919 when asked to write an amateur club show together. 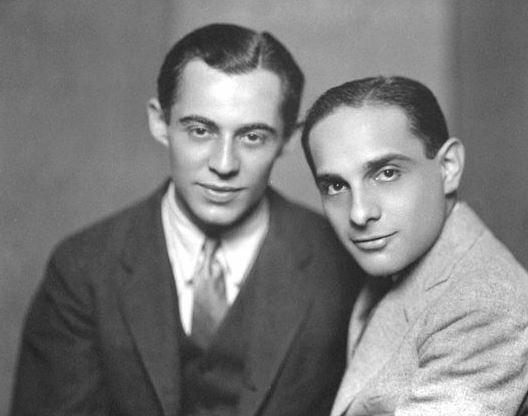 Richard Rodgers was deeply impressed by Lorenz Hart's seriousness and profound knowledge in every aspect of lyric-writing. Quoting from Richard Rodgers' autobiography Musical Stages, "I was enchanted by this little man and his ideas. Neither of us mentioned it, but we evidently knew we would work together and I left Hart's house, having acquired in one afternoon a career, a partner, a best friend and a permanent source of irritation." They always composed together with Rodgers sitting at a piano while Hart would invent wordsmith phrases to verbalize Rodgers' creative melodies. In 1925 they produced their first first hit songs "Manhattan" and "Mountain Greenery" which appeared in the Broadway Musical, The Garrick Gaities. Over the next 18 years they wrote for 29 Broadway musicals in Manhattan and 7 films in Hollywood. The Rodgers and Hart musicals raised the standard of the musical form in general. A Connecticut Yankee (1927) was based on Mark Twain's novel and produced the song standard "My Heart Stood Still". The film Love Me Tonight (1932) produced the songs "Isn't It Romantic" and "Lover". The Boys From Syracuse (1938) was based on William Shakespeare's The Comedy of Errors and produced "Falling In Love With Love". The 1937 musical Babes In Arms produced the song standards "The Lady is a Tramp", "My Funny Valentine", and "Where or When". The 1939 musical Too Many Girls produced the song "I Didn't Know what Time It Was" and presented the debut of Desi Arnaz on the musical stage as well as in films a year later where he met his bride, Lucille Ball. The 1940 musical, Pal Joey, which is considered the Rodgers and Hart Masterpiece, produced the song standard "Bewitched" and has a book by The New Yorker writer John O'Hara who adapted his own short stories to create the storyline. In 1957 Pal Joey was turned into an award winning film starring Frank Sinatra. The Rodgers and Hart collaboration ended in 1943 with Lorenz Hart’s premature death at the age of 48. The musically delightful 1948 film entitled Words and Music is loosely an account of the Rodgers and Hart collaboration, and stars Tom Drake as Richard Rodgers, Mickey Rooney as Lorenz Hart, and features a very young Mel Torme singing the famous 1934 Rodgers and Hart song "Blue Moon", Richard Rodgers’ only popular song not written for a musical. In 1975 the Broadway Musical Revue Rodgers and Hart appeared at the Helen Hayes theater for 108 performances. The Richard Rodgers autobiography Musical Stages was published in 1975. After Lorenz Hart's death, Richard Rodgers turned to his friend Oscar Hammerstein II to begin his second legendary collaboration.